Cebuanos! Good news! You can now shop my brand new and pre-loved stuff from tomorrow until July 15 at the Celebrity + Bloggers food and fashion bazaar happening at The Outlets, Pueblo Verde along M. Patalinghug Jr. Avenue, MEZ II, Lapu-Lapu City. I’m aware that Lapu-Lapu City is a long drive from the city center but hey, it’s better than going all the way to Manila, right? I really hope you’ll travel the distance. I promise it’ll be worth your time as there are plenty of other bloggers, stores and food stalls there too! For your information, my booth will open around 3 to 4 PM tomorrow and will close around 7pm on Sunday. Prices are the same as my Bloggers United items. My assistant Clariss will be the one to assist you so please give her a big Cebuano welcome. I’ll be there personally on June 14 from 5-8pm and will have a special meet and greet around 6pm with the first 50 BPI cardholders to register. (More details about it on The Outlets Facebook page.) I hope you drop by! I suggest going on the first day though so that you can get the best items! I included a few of my Coexist designs as well. Hi Ms Cams! 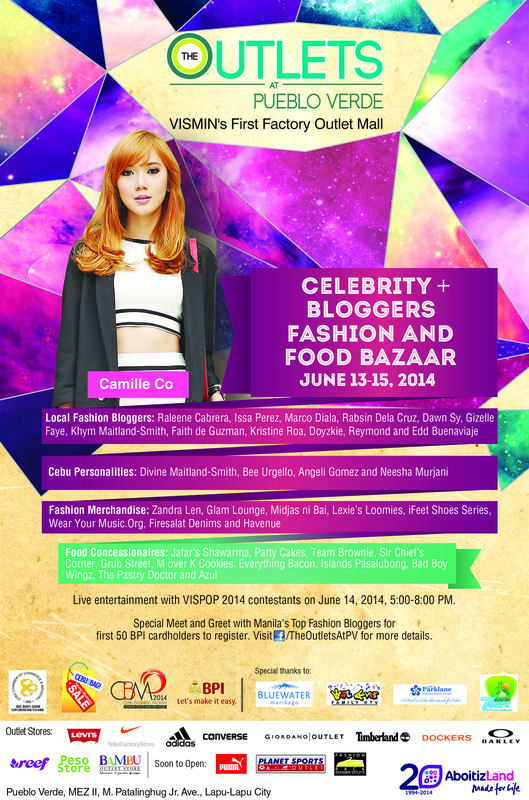 Sayang wasnt able to visit your booth :(( Ive heard weeks ago that it there will be a bloggers’ bazaar. It so happened that ive been on straight duty on those dates since my co pharmacist availed of her vacation leave. Pls let us know if you’ll be having another one soon! How was the bazaar? Thanks Janella! Hope you were able to! Cool!!! :) I had so much fun! Love how you coordinate your necklaces!!! Hi miss Camille .. tanong ko lang po kung mayron bang entrance fee? i hope talaga na makapunta ako. For the non-BPI cardholders… Do we have a chance to take a photo with you? :) Even if it’s a just single photo with you will do..
Another chance to meet you in person! Btw, I was one of the winners who got to met you during the Cut and Style event in SM Cebu. :D I hope I’ll be able to meet you this time again..
Hope you were able to!